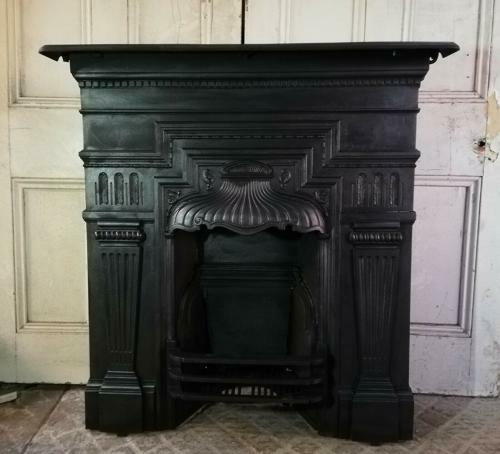 A large elegant Victorian combination fireplace with a Brighton Pavilion style design. The fire is heavy and well made with a beautiful design, ideal for a reception room or large bedroom. The fire has a very ornate smoke hood, in the Brighton Pavilion style, and the legs have a pretty column design. The cross bar has decorative borders and the fire retains its original front bars and large top plate. The iron has been blacked and polished and has a high quality finish. The fire has had some repaired damage and therefore is suited to occasional use. One fire cheek has had some damage and this has been repaired to a high standard. The repair can be seen at the back. The fire brick has some cracks and repairs. The back has surface rust as expected. The front of the fire is in good condition with some light marks and scratches. One fixing lug under the mantel is broken. We can repair this for an extra charge, please contact us for details, or a large head screw can probably be used for attaching to the wall. The fire is a wonderful example of Victorian design and would add fantastic period charm to a fireplace.